"In 1784, Sano Zenzaemon, a minor hatamoto (or feudal lord), killed the son of Tanuma Okitsugu, the despised chancellor of the shogun, under severe provocation. This act broke Tanuma's power, and the grateful populace practically deified Sano, who was allowed an honorable death by his own hand. In the play based on this incident, Sano Genzaemon, (the hatamoto's stage name offers a corrupt official, Miura Arajirō, the honor of shooting down a crane in the presence of the shogun to recover a precious family genealogy in Miura's possession. Miura, however, repays this gesture by insulting Sano, who is shown here on the point of killing him. From the Muromachi period on, there was a tradition of performing plays in shrine and temple compounds. In the seventeenth century the government restricted theater performances in Osaka, Kyoto, and Edo to the entertainment district of each city, but on occasion permitted temporary stages to be erected in shrine and temple precincts. These theaters were called miyachi shibai and, in Osaka, were located in Kitanoschinchi, Tenma, North Horie, Zama, and Goryō. Aside from a brief interruption in the 1840s, such performances were given throughout the Edo period, and many of them are commemorated in prints. 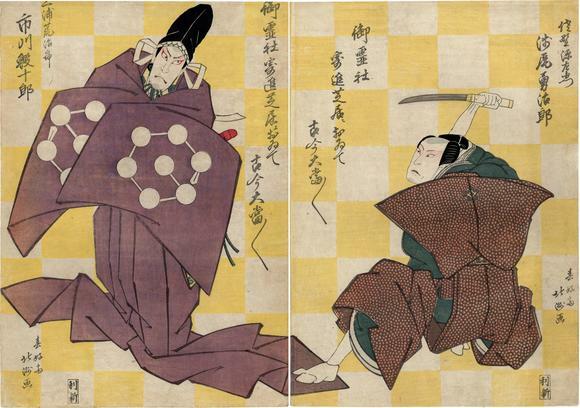 An inscription on each panel of this print states that it was a fund-raising performance at the Goryō Shrine Theater and an unparalleled success. The play was considered appropriate to a fund-raising performance because the name of the play contains the name of the Funaba Shrine where the performance took place. Ōban diptychs with patterned yellow ground were common during this period in Edo and Osaka." Quoted from: The Theatrical World of Osaka Prints by Roger Keyes, p. 90. Illustrated in black and white on page 91. The inscription which appears on both prints reads: "At the theatre of the Goryō Shrine for a donation: as always a great success" (Gorōsha kishin shibai ni oite kokin ōatari ōatari)." Quoted from: Stars from the Stage in Osaka by Matthi Forrer, p. 41. Also, the left sheet is illustrated in color on p. 32. There is another copy of the left-hand panel in the Anne van Biema Collection illustrated in a small black and white reproduction in Masterful Illusions: Japanese Prints in the Anne van Biema Collection, p. 344. This diptych is also illustrated in Schwaab's Osaka Prints, 1989 Rizzoli, plate 53, page 91.